A friend of a friend is a yacht bore, and had gone on at great length about something she called 'tacking'; which, as far as I could make out, meant sailing into the wind. Cycling through the rolling valleys to the south of Stowmarket soon after the millennium, I had wondered if I could use something similar for getting up steep hills. I realise that there may be a few non-cyclists among you, so I'll try not to get too technical, but I often use the technique known as 'getting off and pushing', and so I was willing to try something new. My weaving backwards and forwards across the road had little effect, however, beyond putting the fear of God into an oncoming Range Rover driver - in fact, I think I almost woke him up. In the late winter of 2009 I headed back to Haughley for the first time since the new stretch of the A12 had been opened, replacing the notorious Haughley Bends. Now, the road is crossed by a bridge, and a cycleway takes you all the way to Stowmarket if you should so wish. Until last year, however, getting across to Haughley on a bike involved crossing the dual carriageway. I well remembered my personal 'fear of God' moment back in 2000, descending at a fast rate towards what I had imagined would be a bridge across to Haughley on the far side of the A14; however, the narrow lane spat me straight out on to the dual carriageway itself; only an unlikely gap in the traffic enabled me to cross all four lanes without stopping. Many people think of Haughley (pronounced Hor-lee) as a suburb of Stowmarket, but in reality it is a lovely village, with pretty houses lining its main street. There are even some proper shops, and it is the kind of place you feel just a twinge of envy for the people who live there. I know very well that the novelty of living in the countryside would wear off for me after about eighteen hours, but I can dream. The church is set in a knot of little roads, and presents itself in an unusual way. 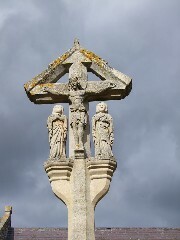 Firstly, it is fronted by a lusciously Anglo-catholic war memorial, Christ crucified with Mary and John either side in the style of a medieval rood. 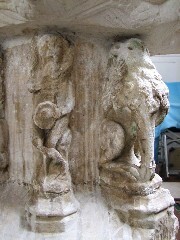 It was repaired at the end of the 1990s after spending several decades in pieces on the ground. Turning to the church itself, the tower and nave appeared to be quite separate, as if they had been built without regard to each other. 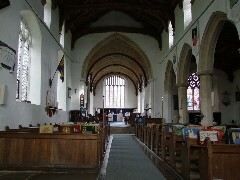 At some later date, a south aisle had been built between and beyond them, joining the two together; but the nave is tall, and the aisle low, so the effect is rather unusual. 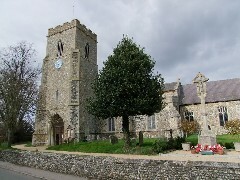 Essentially, this is now a tower in the south west corner of the church, in common with many medieval churches in this area - but the tower was clearly once a separate structure, as at Stonham Aspal. There is still a sanctus bell turret on the nave gable, which may well be original, although there was a bit of a fashion for installing them in the late 19th century. The dedication may seem unusual. 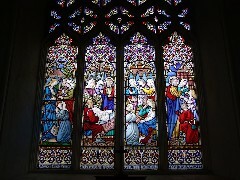 In fact, it was once the most common church dedication in Suffolk. The Feast of the Assumption is on August 15th, and the height of the harvest, and in a strongly Marian county like Suffolk it was always going to be the chosen feast. 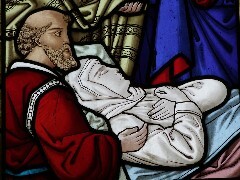 No medieval church was dedicated simply to 'St Mary'. A fair was held on August 15th in the village until well into the 19th century, so it was probably the original dedication, although its current usage dates back only to the medievalist enthusiasms of the Victorians. 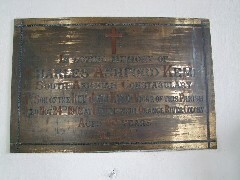 The same dedication has been restored to use at Ufford. The porch is beneath the tower, as is usual with these south-western ones; the outer arch has clearly been rebuilt at some stage, because some of the grafitti on the fluting is now upside down. I remember that the first time I stepped into the porch it was with some expectation, because there is a splendid photograph in existence taken by Cautley in the 1930s. It shows an array of leather fire buckets suspended from the ceiling. 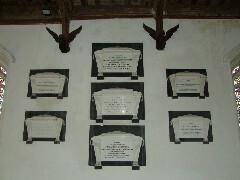 They were there in case of a fire in the parish, and there were about 30 of them. You needed a lot, so that people could form a chain between pond and burning building. I was disappointed to discover that they are no longer there, although I saw with interest that the hooks still exist. A notice in the porch informs us that the church is normally kept locked, but a keyholder is available. 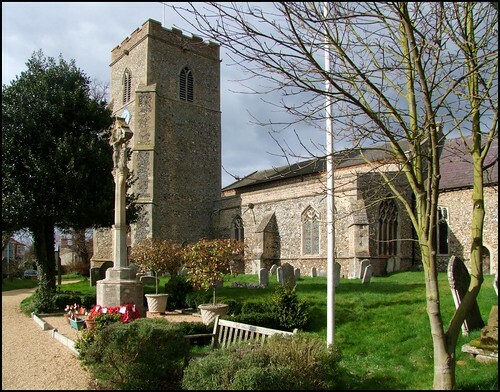 Rather strangely though, on all three occasions that I have visited this church I have found it open, one or two of the churchwardens busy inside. Perhaps they live there. The interior of the church is barn-like and perhaps rather stark, although there are in fact a number of interesting details, which we will come to in a minute. The west window is vast, flooding the nave with light, which is a mercy because otherwise this could be a rather gloomy place. 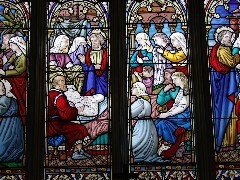 The blame for the restoration can be laid at the door of Richard Phipson, Diocesan architect in the 1860s and 1870s, who was, in modern parlance, a safe pair of hands. 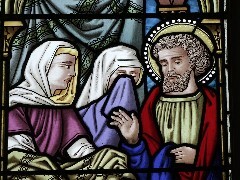 What he didn't restore himself, he oversaw others doing. 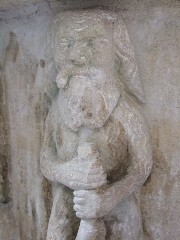 Where money was not a problem, at Ipswich St Mary le Tower for example, he produced some splendid work. He was meticulous to the letter, but sometimes the spirit suffers. 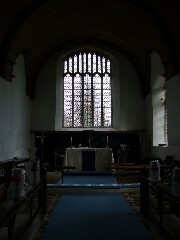 One thing which hasn't suffered is the rustic nave roof, strikingly wide in this openness. 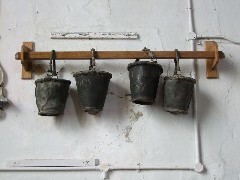 Below the hatchments in the north west corner are four of the leather fire buckets, secure on a rail. They are beautiful, and I was delighted when the churchwardens showed me the others, which are now hanging from the vestry ceiling. They have painted marks on them; some red crosses, and five white strokes. Various guidebooks suggest that they represent the five wounds of Christ, but this seems extremely unlikely. 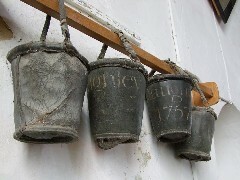 Such a Catholic representation would have been wholly anathema in the 18th century, when the buckets were made. I suppose that they might have been added a century later by a retro-medievalist, but I don't think so. In the 17th century, Haughley was in the curious situation of having recusant Lords of the Manor, and a fierily Protestant minister. The iconoclast William Dowsing didn't come here, and perhaps he didn't think he needed to, although he must have actually passed the church on the day he dealt with Wetherden. 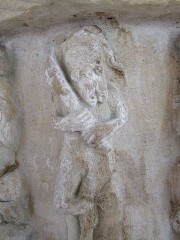 Haughley Park is closer to Wetherden, and the Catholic Sulyards glorified the church there. Not far in the other direction is Gipping, home of the recusant Tyrrells, who were even more unpopular with the Puritans, not least because of their role in helping Mary I take the Church back into Europe. 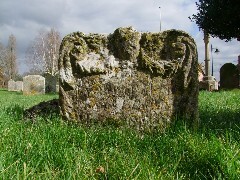 Eventually, most such landed gentry paid the price for their beliefs, and by the 18th century here at Haughley we find the protestant Crawfords of Haughley Park putting up their hatchments and commemorating their dead in the south aisle. 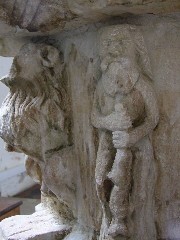 The south aisle is rather interesting. It is a substantial creation, but low roofed. Most aisles were built to enable liturgical processions, and had the added advantage of providing more space for gild and chantry altars. 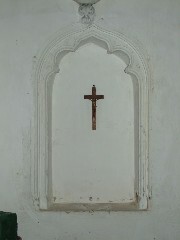 But the south aisle here may actually have been built as a chapel dedicated to the Holy Cross. The roof is a riot of angels, some of them playing musical instruments. The modern east end sanctuary is rather lovely, another relic of the quasi-ritualist enthusiasms of a century or so ago. 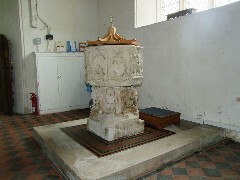 At the west end of the aisle stands the font, a fine example of the typical East Anglian design. 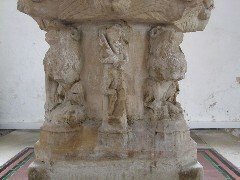 The symbols of the four evangelists are a bit battered, but some Catholic symbolism survives, suggesting that it was bashed about a bit and then plastered over. The Puritans are often blamed for this sort of thing, but most fonts were attacked by the Anglicans a century earlier, and I think that was the case with this one. The woodwoses around the stem are super, and all of them different, perhaps the best in Suffolk. 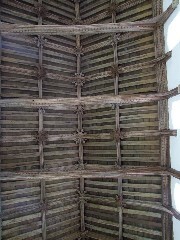 According to the excellent church guide, the rood beam was still in existence in 1865, but no trace of the medieval liturgical apparatus survives today. Now, I find this rather curious. Given the huge Tractarian influence here (the dedication, the war memorial, and so on) how is it that something so liturgically significant was removed? Was it so that something could be put in its place? It did occur to me that the same thing might have happened here as happened a couple of miles away at Elmswell - was there a late 19th century rood and screen installed, replacing the remains of the old one? And was the newer one here later removed, as many were? I wonder. The ceiling of the chancel is barrel-vaulted, which is practical and pleasing. 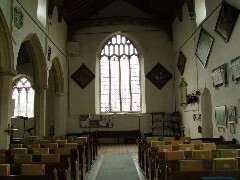 The choirstalls below are now used by a traditional robed choir, restarted in the 1990s after some years of absence. 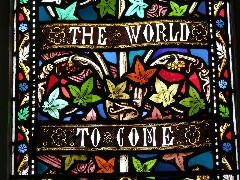 And this is one of the reasons I liked Haughley church, for its sense of being part of a living community. It isn't outstandingly attractive, yet it is welcoming, and contains much of interest.